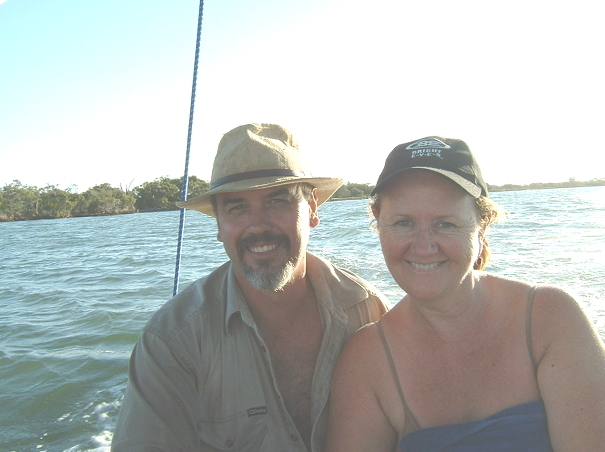 Steve Scott is a married 54 year old father of 3 who has enjoyed a life long passion with the water, pursuing fishing and boating interests across much of Eastern and Northern Australia. Growing up in the southern N.S.W coastal town of Kiama Steve travelled and worked extensively through regional Australia, camping and fishing from Tasmania to Thursday Island and across to Darwin before finally settling in Bowen, North Queensland in 1986. Leaving there in 1993 Steve worked in Mt Isa, Gladstone, through the coal fields of the Bowen Basin and across to Karratha on West Australia. With a background in the Engineering, Manufacturing and Construction industries Steve has spent over half his working life north of the Tropic of Capricorn exploring the vast river and estuary systems that teem with Australian sportfish and wildlife. Having run their own engineering company for many years specialising in precision robotic welding on the Gold Coast Steve and Linda decided to sell up and pursue a dream that was born on the banks of Lake Julius, northeast of Mt Isa late one night in 1994. Whilst unloading a tinnie from the rooftop of a Landcrusier ute, Steve and his mate came unstuck leaving two blokes and a 3.7 metre tinnie lying in a tangled heap on the sandbank. Remember that trip Ashley? No one was hurt but there had to be a better way and Steve set about designing a light weight, single person boat loading system that could handle the rugged Australian conditions. It was here that the BoatHoist SideWinder was born, a tough system conceived in some of the toughest country in Australia. The design requirements were for a simple low maintenance system that could be fitted to all vehicles with heavy duty roof racks. Keeping the system simple gives customers the ability to fit the SideWinder themselves and with only one moving part, the 12 volt electric winch, there is nothing that can go wrong while traveling even the roughest dirt roads. From this one product Steve and his wife Linda have developed a business that now boasts a range of 12 custom designed loaders and folding aluminium trailers that are all Australian made. Steve has even had his flare for designing acknowledged nationally with an appearance on the ABC TV ‘ New Inventors” program in 2006 and again in 2011 when he presented the award winning StrongArm Kayak Loader. In 2010 Steve and Linda moved to Nelson Bay where the BoatHoist business has thrived, with the BoatHoist range of products now supplied nationally to all Australian states. Nelson Bay has some of the most picturesque waterways in Australia including Birubi Beach, Fingal Beach and One Mile Beach. It was here that Steve purchased his first Stand Up Paddle Board and rediscovered his passion for surfing. SUP surfing has opened up a whole new direction for BoatHoist with the introduction of the StrongArm SUP loader and the HiRoller SUP Trolley. In 2015 Steve and Linda formed an alliance with Export-X and began exporting the StrogArm products to America where they are now sold online via Amazon. Where to from here? Who knows but the journey so far has certainly been eventful to say the least.